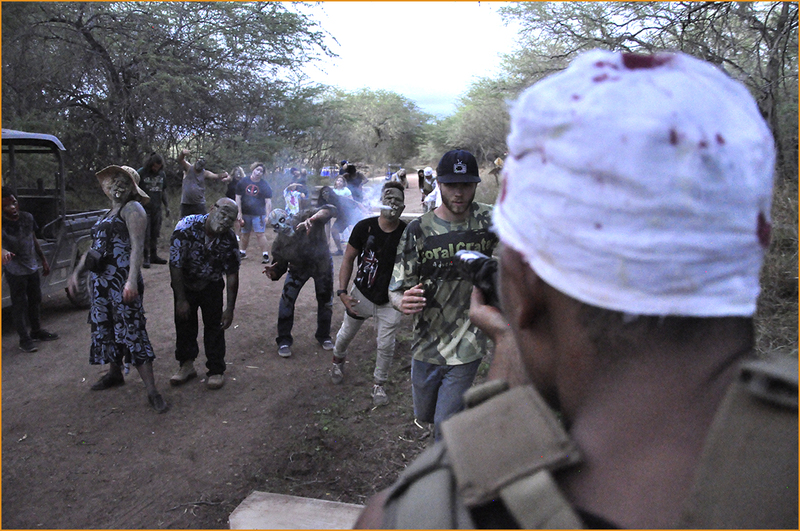 On our signature 1 hour Coral Crater Zombie Apocalypse: Rescue Mission, you'll be in a live action zombie shooting experience with ziplining and free-fall fun! Oahu needs your help. A terrible virus has spread all over the island and turned most of the residents into bloodthirsty zombies. Paradise is now swarming with the undead, who are motivated by one thing alone: to get to the few remaining uninfected humans and devour their brains! Warning: This event is not for the faint-hearted. Are you up for the challenge? Due to high demand for this event, limited tickets are available and pre-booking is essential to avoid disappointment. There has been news of a single survivor who is hiding in an abandoned village in Coral Crater. Your mission is to find and rescue that survivor before the zombies can get their hands on him. Join us on this thrilling adventure and save an innocent life from a horde of undead monsters. Ride with us on this off-road adventure to search the ghostly village for the single survivor. The adventure isn’t over with the identification of the uninfected human; you still need to make it out of that messy situation and zipline into safety before the zombies can catch you. The Zombie Apocalypse Rescue Mission is a live action shooting experience. The setup is a video-game style: you use a replica M4 laser gun to kill zombies. This weapon is built from actual M4 bodies. It is the full weight of a real gun and lets you feel actual recoil with each shot you fire. Zombies wear targets that flash when hit. Make sure you aim well, as only head shots can stop the infected attackers. This experience is not for the faint-hearted. All squad members must be physically fit, emotionally stable and brave as Hawaiian warriors to meet the challenge. Are you ready to join us on this unique experience? Please make sure you book in advance, as the Zombie Apocalypse experience is in high demand. Small adventurers must be a minimum of 6 years old and weigh 60 lbs. Those who are under 13 must be with their parent or guardian. As ziplining is part of this mission, the maximum weight is 275 lbs. The mission is completed in approximately 60 minutes.